We invite you to join us and TV chef, Adam Swanson on a life-changing exploration of Italy’s finest food, culture and belissimo landscapes. With Adam’s expertise, passion and knowledge of the land guiding the way, you’ll have the chance to go where the locals go and dine as the locals dine – all while creating travel memories that will last longer than the food on your plate. From Rome to Siena, Bologna and Venice (with plenty more destinations to savour along the way), you’ll delve deep into an authentic culinary adventure, fit for a foodie fanatic. Contact your Travel Agent today or call 1800 002 006 for more details. Limited seats available. Adam Swanson, Adelaide’s renowned chef and restaurateur, is famed as the ‘King of Pasta’. 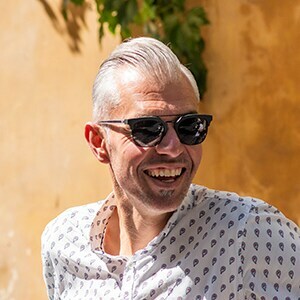 Star of TV series, ‘Adam’s Pasta Pilgrimage’, the celebrated chef explores the origins of Italy’s finest food while sharing his passion for Italian cuisine. After my family holiday with Trafalgar. I felt inspired to showcase the authentic Italy. Let me share with you my passion for food, wine and the secret spots only the locals know about, so you see simply the best Italy, every step of the way. Hearty and bursting with flavours your journey begins in Rome. Spend the afternoon exploring the city before meeting your Travel Director and Australian Chef & TV personality, Adam Swanson. Then it’s time for a cheesy affair as we ‘Dive Into Culture’ and learn how to make an authentic Italian pizza, and share a tasty slice or two at our Welcome Dinner. Later enjoy an orientation drive through the city – a perfect introduction to this beautiful city, the centre of which has been proclaimed a UNESCO World Heritage Site with its ruins, imposing monuments, statues and fountains. This morning join a Local Specialist to delve into centuries of history and culture, including a guided tour of the Vatican Museums. Gaze up at the wonder of Michelangelo’s frescoed ceiling in the Sistine Chapel and explore the Catholic shrine of St. Peter’s Basilica. After we then travel into the scenic Tuscan hills to medieval Siena with its honey-stone façades and cobblestone streets. View the Piazza del Campo where the biannual Palio horse race takes place, ornate medieval palaces and 14th century marble Duomo. One of the most famous products of the Sienese gastronomy is Panforte cake, its history dates back to medieval times. This afternoon we take you to Bakery Heaven to enjoy a hidden gem, the most delicious traditional panforte. Arrive at your villa style hotel in the beautiful tuscan hills. Tonight join together for canapes and a cocktail making class, to learn the art of the refreshing ‘spritz’ drink. This morning the exquisite sights of Florence are brought to life on a walking tour in the expert company of a Local Specialist. See the magnificent Gothic Duomo and famous Baptistery before marvelling at Michelangelo’s statue of David at the Academy	of Fine Arts. Take a scenic drive into the Chianti hills, past vineyards and gardens to a delightful Castle. We ‘Dive Into Culture’ and gain insights into the art of making Chianti wine, whilst enjoying a extra virgin olive oils & Cheese tasting with your Local Specialist. Spend the day soaking up the sun by the pool or choose an Optional Experience to visit San Gimignano. Join Adam for a drive to the nearby hilltop town of San Gimignano, known as the ‘medieval Manhattan’ of Tuscany. Surrounded by fields of sunflowers, vineyards	and olive groves, this is Italy’s best preserved medieval city and will give you a taste of day-to-day life in Italy during the Middle Ages. This evening, we ‘Connect With Locals’ joining a local family for a Be My Guest dinner enjoying delicious specialities against the backdrop of picture-perfect olive groves and vineyards. Saluti! Enjoy a leisurely start today. Feast your eyes on the vibrant colours and busy stalls heaving with fresh produce at a local Florence food market where you will join a Local Specialist professional chef & Adam for a tasty introduction to Italian cuisine. Learn how to cook like only an Italian, selecting your fresh produce from the market and preparing your meal of handmade pasta, which you will enjoy with a delicious glass of local wine. The tastes of Tuscany still lingering after an unforgettable Regional Meal, we return to our hotel in the Tuscan hills for the night. Journey through the Tuscan Hills on our	way to Bologna. This city is renowned for its culinary tradition and cured meats such as prosciutto, mortadella and salami. It has also given its name to the well known meat-based pasta sauce called ragù alla bolognese. Here we visit “Eataly World” the world’s largest agri- food park, covering an	area of 100,000 smq in Bologna. Discover Italian agriculture by visiting 2 hectares of open-air fields and stables housing more than 200 animals and 2000 cultivars. Join an included class to experience an insight into Parmigiano Reggiano cheese. Discover how the cheese masters use ancient traditions and techniques to make the undisputed king of Italian cheeses! Spend time visiting 40 farming factories and observing how meat, fish, pasta, oil, beer and	sweets are processed. Taste traditional Italian	food at FICO’s 40 restaurants and refreshment points. Tonight, you might like to join Adam in Bologna for dinner, sharing your food and stories together for a wonderful evening. Continue northbound for Venice, the Queen of the Adriatic and our home for the next two nights. Cruise to bustling St. Mark’s Square on a private launch. View the famous Bridge of Sighs, so named for the sound condemned prisoners made at catching their last glimpse of beautiful Venice, the exquisite Doge’s Palace, St. Mark’s Basilica and the Campanile. The evening is yours to explore - in search of the cosiest trattoria in town or perhaps take a ride on a gondola – a great way to see the city in all its glory. The sights and sounds of modern Venice come to life today as we join our Local Specialist on a tour of the vibrant Rialto Food Market, which has been feeding Venetians since the 11th century. We wander through the narrow calli - seeing the ornate façades of merchant houses that line the canals. Enjoy an italian local lunch, with a tasting of fresh and light ‘bubbles’ - a glass of Prosecco, which is produced in Veneto. Enjoy an afternoon at leisure for one last taste of Venice. Our adventure through Italy’s charming cities is about to come to an end. We celebrate newfound friendships and an unforgettable culinary journey at our Farewell Dinner. Join Adam and your Travel Director as we discover the Venetian Lagoon by private boat. Enjoy a delicious seafood bonanza, on the fishermen’s island of Burano, famous for its multi-coloured houses. Say arrivederci to Italy’s Finest and your fellow travellers as your Foodie holiday comes to an end. One group transfer is available to Venice airport. Conditions apply. Booking Deposit & Final Payment: A non-refundable deposit of $200pp is due within 7 days of booking. Full balance is due no later than 60 days before departure. For bookings made within 60 days of departure full payment is required within 48 hours. Fares: All fares are quoted in Australian Dollars. Fares include transport, entrance fees as per itinerary, plus services of a Travel Director and Driver and meals as specified. Accommodation: Hotel accommodation includes twin-bedded rooms with private facilities, all hotel service charges, baggage handling fees and local taxes. Single rooms are available on request basis and a single supplement applies. Travel Insurance: We strongly recommend that passengers purchase travel insurance. Passports & Visas: It is the responsibility of each individual passenger to have a valid passport and necessary visas, as well as to comply with entry, health or other requirements for the counties visited. Single Supplement: The supplement for a single room is $735. Gratuities: Option to pre-pay gratuities for Travel Director and Driver, AUD$115 per person. Whilst information is correct at time of printing, trips are subject to change. For full terms and conditions please contact Trafalgar at www.trafalgar.com or contact your local Travel agent. Trafalgar is a participant of the AFTA Travel Accomodation Scheme 2014. ATAS number: A10534.